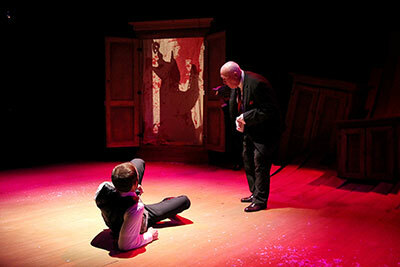 IMAGE: Dain Geist and Adam Gibbs in Marlowe’s Doctor Faustus at Classical Theatre Company. Photo by Pin Lim. Adam Gibbs as Faustus in Marlowe’s Doctor Faustus at Classical Theatre Company, through Feb. 16 at The Barn in Houston. Houston actor Adam Gibbs has proved to be a standout on whatever stage he finds himself, which right now, is at Classical Theatre Company (CTC), in Christopher Marlowe’s Dr. Faustus, running through Feb. 17 at The Barn. 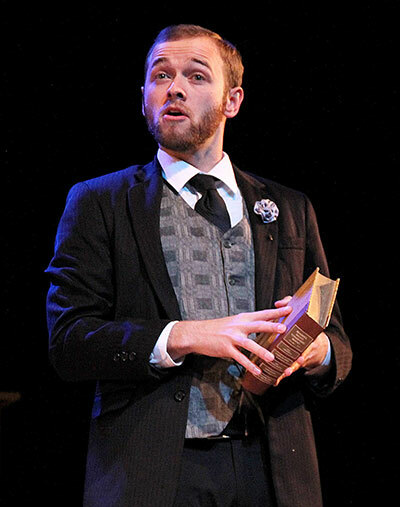 A graduate of Sam Houston State University, Gibbs has performed at The Alley Theatre, Stages Repertory Theatre, Black Lab Theatre and CTC. Gibbs visited with A + C Editor in Chief Nancy Wozny about the role, the acting gig and his big move. 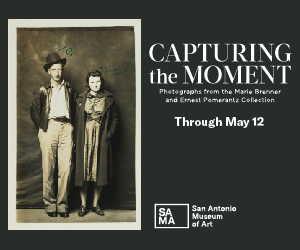 Arts + Culture TX: The last time I saw you on stage you were googling cat videos in Black Lab’s sassy production of Assistance. Last night, you were sucked into eternal damnation. As an actor, how do you enjoy such a shift? Adam Gibbs: The shift is a blast! It seems though that when I’m working on a musical I’m ready to be in a play, and when I’m working on a play I’m ready to be in a musical. The same goes for comedy/drama. I don’t know if it’s a “grass is always greener” kind of thing, but fortunately with this show, Faustus goes on such a journey in two hours that it constantly keeps me on my toes. A + C: Talk about your preparation for the role of Dr. Faustus. Did you study Latin in High School? AG: I wish I could say that I studied Latin in high school, but alas, two semesters of Spanish is all I could manage. With a role such as this, step one for me is as simple as knowing what you are saying. Really dissecting the script and the language, so you can speak with confidence and intent. What’s great about classical material such as this is that Marlowe’s words are all incredibly specific. Each different word is chosen for a reason, and it’s the actor’s job to recognize why, and relay that to the audience. Beyond that, with such a heavy load of lines and a short rehearsal process, it is imperative to get off-book as much as possible prior to the rehearsal process beginning. Before rehearsals, it’s important not only to get as much of the script in your head as you can, but also to keep Faustus, the man, in your mind throughout your day. You must ask yourself who he is and why he does what he does. How would he react to different situations? The more that can be done ahead of time, the easier it is to really discover your character once rehearsals begin. A + C: Although this role is miles apart from the millennial man you played in Assistance, I saw the same swagger in your command of the stage space. Talk about the embodiment part of owning a role. AG: When starting out I always try to come from a place of honesty, no matter the character. But eventually, you discover what is honest for you, the character rather than what is honest for you, the actor. If you find what the character holds true, what he/she wants, what his/her objective is, the physicality usually falls into place naturally. A + C: I named your performance, opposite your very talented wife Rebekah Stevens, in Assistance as one of the best of the year. Now you are playing opposite the devil, as in James Belcher as Mephistopheles. Daunting? AG: First off, my mother couldn’t have been more excited, so thanks for that. In addition, my wife and I are incredibly honored. A + C: I live to make mothers of artists happy. Carry on. AG: I’ve had the pleasure of working with James over the past several years at The Alley, so my first question when I was offered the role was, “who is playing Mephistopheles?” in full hope of hearing “James.” And lucky for me and the CTC family, that is exactly what I heard. I couldn’t be happier to share the stage with such a veteran. I have been hoping to work with him in this capacity for years now. What I have learned from James cannot be put into words. This will forever be one of my most cherished experiences. 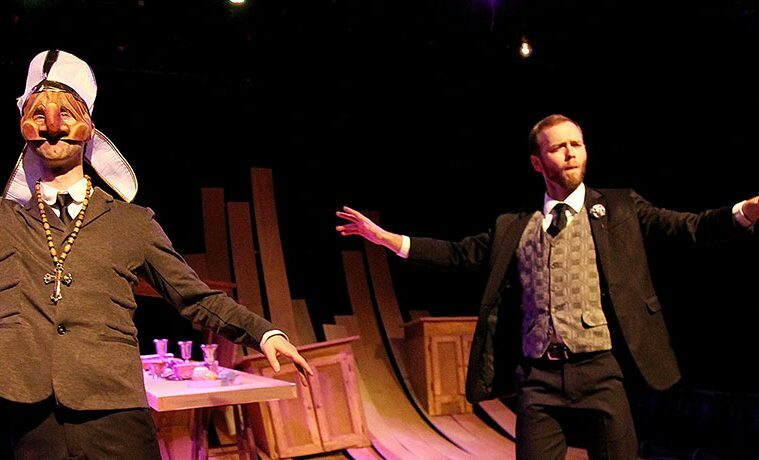 Adam Gibbs and James Belcher in Marlowe’s Doctor Faustus at Classical Theatre Company. Photo by Pin Lim. A + C: I’ve been a fan of Philip Hays’ work since I saw a production of Margo Veil that he directed for Mildred’s Umbrella. His Faustus has a Fellini spin on it. Agree? How do you think this fits into CTC’s vision of boldly re-visioning classical plays? AG: A little inspiration from Fellini could do us all a favor. He didn’t win all those Academy Awards by accident, he had a vision. Philip has a vision that is very creative, unique, and intelligent. It is quite different from what you often see in Houston. I told him after opening that I was impressed by his direction of CTC’s Ubu Roi, and it is exciting to see how he’s grown from then to now, as well as how I look forward see how he grows beyond Faustus. I think having Philip directing at CTC is mutually beneficial for both parties. If any young director is bold, it’s Philip Hays. A + C: There are some thrilling bells and whistles in this production. How do you exist in this world so wonderfully created by the production team, that includes Ryan McGettigan’s set and Macy Perrone’s costumes and Matthew Schlief’s rock concert lighting? AG: This dream design team couldn’t make it any easier to live comfortably and honestly in the space. It’s almost unbelievable how such a relatively small group of people can produce such an intensely deep and textured world. Just look at their resumes. They are working all the time and for good reason. If you need any convincing come see Dr. Faustus. A + C: What made you want to become an actor? AG: It’s what I’ve always done. I made my stunning debut as a Munchkin in The Wizard of Oz at The Henderson County Performing Arts Center when I was five. My hometown community theater has been responsible for an incredible number of working actors all across the country. It’s where my family spent many years producing countless productions. Not to mention, I saw my mother play Blanche in A Streetcar Names Desire twice by the time I graduated college. A + C: Houston dance and theater stages are becoming more and more populated with Sam Houston State University grads. What did you learn there that gave you survival skills onstage and off? AG:The SHSU crew is an ever-expanding force to be reckoned with. It’s where I started learning who I was as a person and as a performer. It’s where my network started. A + C: News has it that you are leaving Texas. AG: Yes, I suppose now is a good of time as any to regretfully inform that Dr. Faustus will be my last scheduled show in Houston as my wife and I make a move to San Diego. We have been incredibly fortunate and grateful to have received the work we have. Houston will always be where our careers began, and we look forward to working here again in the future. But for the time being, we are looking for an adventure, and an opportunity to see more of the world and work in new places. Houston holds a special place for both of us.